Two Frame Mosaic LRGB image of the Orion Nebula M42, taken with a 130mm Astrophysics refractor. Camera ST8300M Astrodon LRGB filters. Image Data: A series of 1400 s, 600 s, 120 s, 30 s, 10 s LRGB images were taken over three nights. At a distance of 1500 light years, the great nebula in Orion can be found just below the hunter’s belt. 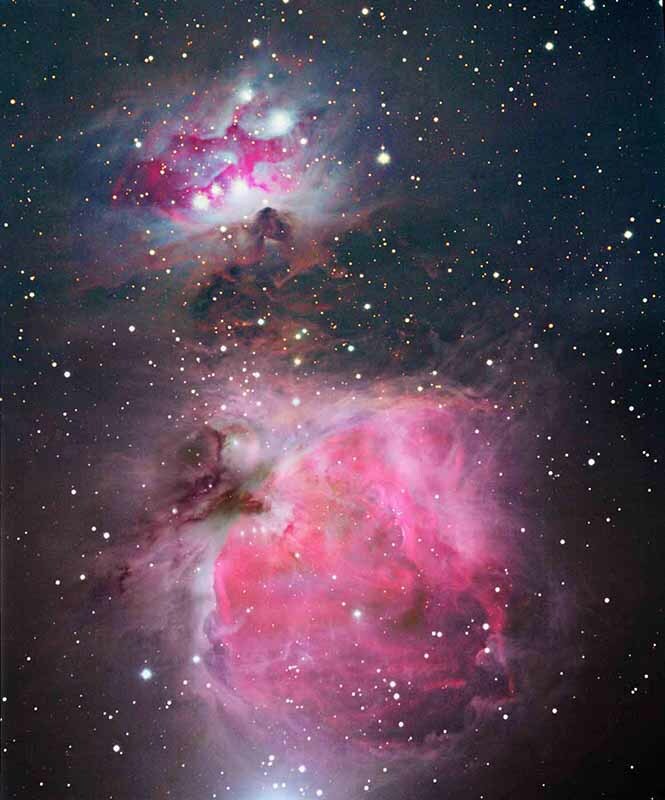 Designated as M42, the Orion Nebula is one of the most impressive sights in a telescope. The red glow results from young hot stars in the nebula’s center. These young stars give off ultraviolet radiation which ionizes the surrounding hydrogen gas. The Orion Nebula has been referred to as a stellar nursery because many of the young stars are still surrounded by their hydrogen gas cocoon. The best time of year to see Orion is during the cold winter months in the southern sky. The three dimensional appearance of the nebula was created by taking a series of different exposures and stacking them together. The composite image reveals the outer faint nebula without washing out the bright core.